Days before the publication of Chris Anderson's new book, I was able to get my hands on a pre-publication copy. I cracked it open, hoping that he would be able to once again set the world on edge, as he did with his earth-shaking book The Long Tail, back in 2007. I'm happy to report that this book Makers: The New Industrial Revolution is important, engaging, and deeply personal. Anderson, who has been observer and chronicler of the web, now shares the details of his childhood and family history of invention and entrepreneurism. His Grandfather invented, and patented, the automated home sprinkler. And Anderson remembers fondly working at his Grandfather's workbench. What Anderson reveals is that he isn't a writer, or an editor, or an observer -- he's a Maker. And, as that is the topic of the book -- he is able to take readers on a first person narrative journey into the future. "The first generation of of Silicon Valley giants got their start in a garage, but they took decades to get big. Now companies start in dorm rooms and get big before their founders can graduate" says Anderson in the books first few pages. And, the shift from web pages and and 'atoms' to the emerging digital world of 'bits' drives the books pages from here on out. No longer is a 'factory' the basis of a company's scale or speed of growth. Rapid Prototyping technologies like 3D printers, laser cutters, and shared workspaces like TechShop are democratizing innovation in the physical world of atoms. Here Anderson reveals a fact I didn't know, that the Obama administration has embraced the power of the digital shop floor, putting makerspaces in more than 1,000 American schools over the next four years. What is emerging is a Maker culture, funded by Kickstarter, created by MakerBot (a 3D printer company) and others including Shapeways and Quirky (another Maker marketplace). Central to Anderson's thesis is a three point collection of characteristics that are transformative within the Maker Movement. A cultural norm to share those designs and collaborate with others in online communities. The use of common design file standards that allow anyone, to send their designs a commercial manufacturing service. For Anderson, the coming revolution could not be more profound. Much as we now take for granted the "print" button on our computer, and the desktop laser printer or ink jet that allows pixel prefect graphic rendering, he predicts a near future when our home computers will have a "Make" button. That button will allow you to print to your 3D printer, or send a 3D file to be created for you at a long print shop or in mass quantity in software enabled factory. In Anderson's new voice, and personal journey, the whole Anderson family gets to participate. His daughters, when their 'screen time' with the Sims comes to an end, shift their digital interests to the real world, and use the family MakerBot printer to print out doll house furniture. Says Anderson: "If you're a toy company, this story should give you chills." As he explains it -- the world of self-made, or amateur content on the web was a precursor to the world of atoms we're now approaching. "On the web, creativity is expressed in digital form -- words pictures, videos, and the like." Pinterest, Tumbler, Facebook may not compete for money -- but they compete for time and attention. "A massive shift from the commercial content companies of the 20th century to the the amateur content companies of the 21st." The changes from mass creation and consumption to niche creation and consumption is being driven by technology, creative passion, and changing consumer culture. So -- Anderson's journey from observer to Maker puts him in the white hot center of this story. Anderson's company -- DIY Drones -- builds and sells open-source radio controlled helicopters and airplanes. His community of creators, designers, and inventors all use the site to share ideas and plans. And Anderson used the power of the web to find, partner with, and eventually hire a 26-year-yold who he said had proven himself by making extraordinary things. Today 26-year-old Jordi Muñoz is the CEO of the company, with revenues just over $3 million dollars. So, why is this shift important -- even critically important -- for the U.S. economy? So, where is the Maker Movement, from an innovation timeline perspective? He thinks we're where the PC movement was in the mid 1980s. Somewhere between the Apple II and the Mac. Soon we'll have 3D printers in our living rooms, and software that's easy to use with a "Make" button built in. We'll still buy mass produced goods -- but "industrial artisans" will emerge to create quality niche goods. The future belongs to Makers -- says Anderson. The future is Design. So tell your kids to learn how to draw, use 3D programs, write code. Makers are the new power of the economic engine. That's a big shift, and worth all the time and attention that Anderson lavishes on it in these pages. 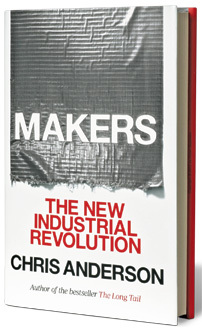 Chris Anderson has cemented himself as the premier chronicler of the digital world with the soon to be published new work Makers: The New Industrial Revolution. Step into his Maker world, and you may never want to leave.